Hey guys, I have a super easy, yummy soup recipe for you all today. It has been freezing here in Michigan, and it even snowed on Halloween, so I’m in full on comfort food mode over here. 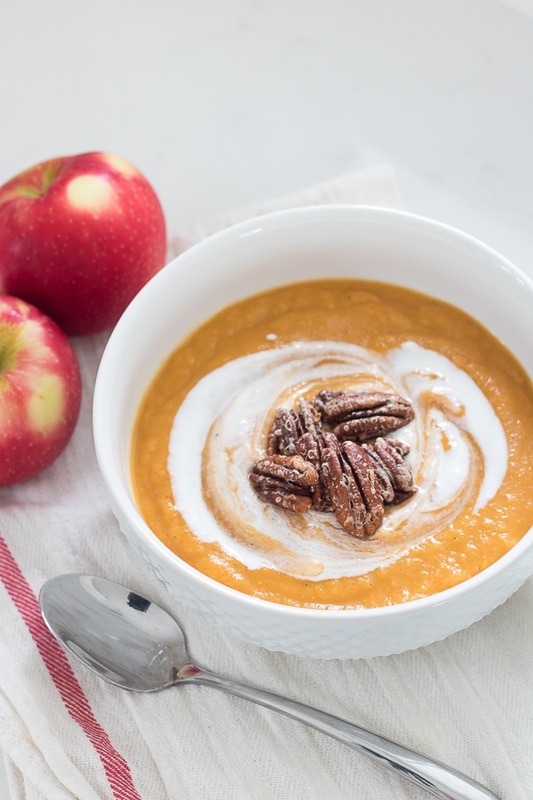 This Roasted Apple Sweet Potato Soup is quick to put together and you probably have all the ingredients on hand. Basically you chop onions, sweet potatoes and apples. Toss them in some olive oil, maple syrup, cinnamon and salt and pepper. Roast it all in the oven and blend it up! Side Note: I make this same exact recipe, but add chicken sausage to the mix and then don’t blend it up and just eat it as a sheet pan meal. So good! Back to the recipe. You can be fancy and top this with creme fraiche and spiced pecans or eat it straight out of the blender. Chop apples, sweet potatoes and onion into medium chunks. Toss with olive oil, maple syrup, cinnamon, salt and pepper. Roast in the oven at 375 for 45-55 minutes. Add more stock if too thick. For the Pecans mix sugar, salt, cinnamon, cayenne, and water. Toss the pecans in and roast in the oven for 10 minutes at 400 degrees. I use a silicon mat for easy clean up. I also wanted to mention a few housekeeping things here on the blog. I finally got my font color switched to black! I know lots of you have been having issues reading the gray and every time I fixed it, it somehow reverted back. I should not be allowed to use technology. Thankfully my tech guru fixed the issue. My commenting section was broken and I didn’t realize you all weren’t getting my responses emailed to you! So that’s fixed, but if you were waiting for a response from me, check back on that post. I really try to answer everyone! I’m trying to get better about listing every single source that I can and I also added a “Shop our Home” page here on the blog. I’m slowly adding to it everyday, but if you are looking for something in our house that’s a great page to check out. I also added a New Home Tour page to the blog so if you are new here you can go back and see all the rooms at our new house that I’ve revealed so far. That’s all I got today, have a great weekend! The soup looks so yummy and easy. Can’t wait to try it! It’s a nice cozy meal thanks Madeline! Are you sure it isn’t desert? Where do you use the cayenne in the soup or with the candied pecans?? In the pecans, sorry just edited the recipe. 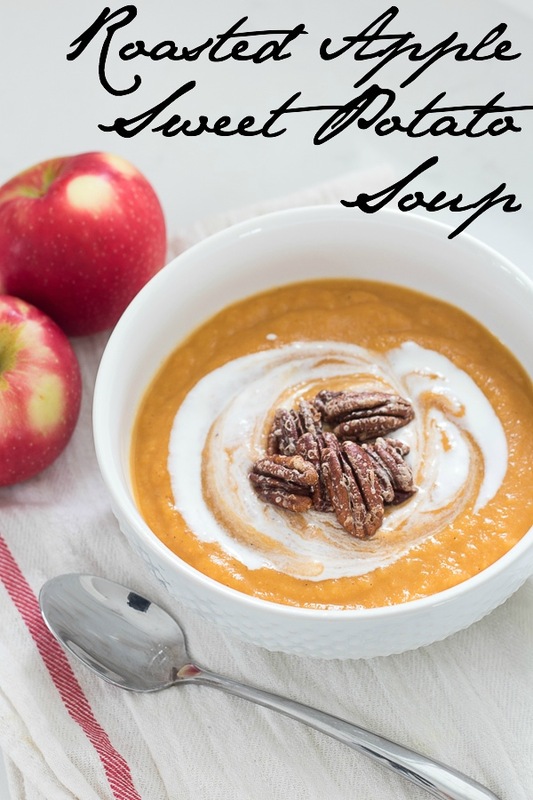 So great to find a blogger from right here in Michigan :) The soup looks delicious, and I look forward to trying it. Thanks! Hello fellow Michigander, this is perfect for this freezing weather! I made the soup and I do not cook! It was a hit. Glad you liked it Jamie!